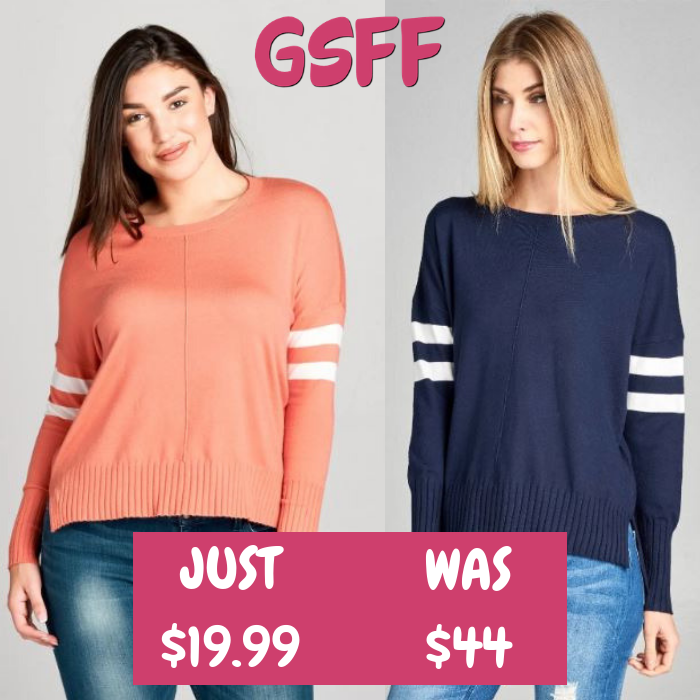 Striped Sweater Just $19.99! Down From $44! FREE Shipping! You are here: Home / Great Deals / Striped Sweater Just $19.99! Down From $44! FREE Shipping! Until December 4 only! At Jane, you can score this Varsity Striped Sweater for just $19.99 down from $44 PLUS FREE shipping! Super comfy and with a breathable stretch, this cute sweater will keep you nice and cozy all winter long! It features a medium gauge knit weft, cinch ribbed cuffs and hem, a side slit design, for easy wear over denim and a wide neckline silhouette. Pair with your favorite skirt, leggings, and booties to complete the look.